The Cells4Life Volume-reduced cord blood storage, is similar to what many other umbilical cord stem cell storage providers in the Middle East offer, but with many very important benefits. Our Volume-reduced cord blood storage focuses on extracting the maximum number of haematopoietic stem cells (HSCs) from the umbilical cord blood. Cells4Life’s automated, computer-controlled processing system delivers the highest published cell recovery rates in the industry: 96%. Other processing methods for volume-reduced cord blood storage have been shown to recover only 81% of cells. One of the most important aspects in cord blood transplantation is the volume of viable cells at the time of transfusion. 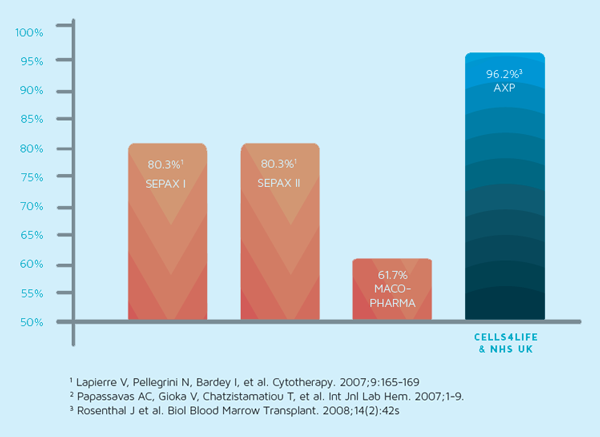 AXP Technology saves 96% of cells following the cell extraction method. This extraction method is also adopted by the New York Blood Bank as well as other cord blood banks around the world. More umbilical cord stem cells are a key clinical parameter that physicians use to identify if a sample can be used in therapy. Cells4Life uses the state-of-the-art +Cell technology that ensures almost 20% more cells are retained than any other volume-reduction technology used by other umbilical cord stem cell storage providers in the GCC & UK. Storing the maximum numbers of HSCs means more access to future treatments and developments. Because the cord blood volume is greatly reduced, this offers the benefit of lower storage costs. Well informed and well organised team. Explains everything in detail and guides you through entire process. Keeps in touch through emails and regular updates. Keeps you informed about developments in the usage of Cord Blood and what Innovations or researchers are working on. One stop shop for Cord Blood info. The process with Darryn and his team was so easy and flawless that when it came to collection it went of without a hitch. Highly recommend as the best company to go with. Best investment and insurance for the family. Nobody should miss out on the opportunity to leverage the future potential of science. Stem cells already has great benefits now but there is surely more to come every year that lies ahead. So happy we chose them to store our newborn at the time! Detailed information and support given before and after the collection; personalized follow-up letters and emails. The experience made us feel that our baby’s u cord and stem cells are in safe and professional ‘hands’.